”The Flintstone Gym” is an exhibition which tells about the routines that I always get as soon as I return to Rio. It may be the gym on the beach that I visit often, (The Flintstone gym) or my friends and their families with whom I hang out. (the Lins family, except for Sarah who was sleeping-at-the-moment) These pictures are in sharp contrast to the tight and almost documentary pieces that I showed last spring in Rio. They are airy and paint-like while they possess something of magical realism. It is a picture of a welcoming city, and it represents a complete contrast to the gigantic economic gaps that are clearly built into the cityscape, where favelas/shacks exist wall-to-wall with the most exclusive homes. This city signs with its paradoxes. The exhibition is also the first in over 20 years where I only show works on canvas. I’ve left the aluminum sheets right now, but I’m using some of the same mixing techniques I developed for a long time. 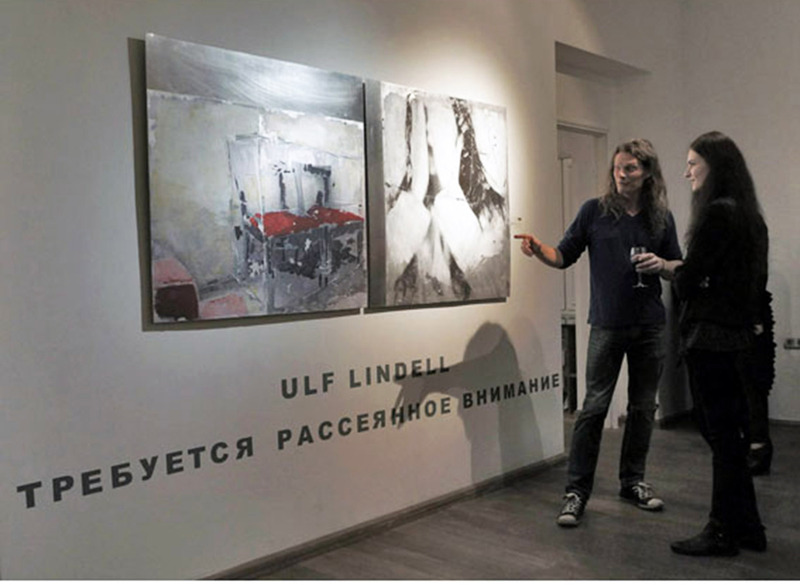 Ulf Lindell artist from Sweden has been exposing his images around the world for over 30 years now. He has had individual shows in addition to Stockholm, also for example in Paris, Moscow, St. Petersburg, Sao Paulo and Bogota. He has already exposed here in Rio de Janeiro several times before. 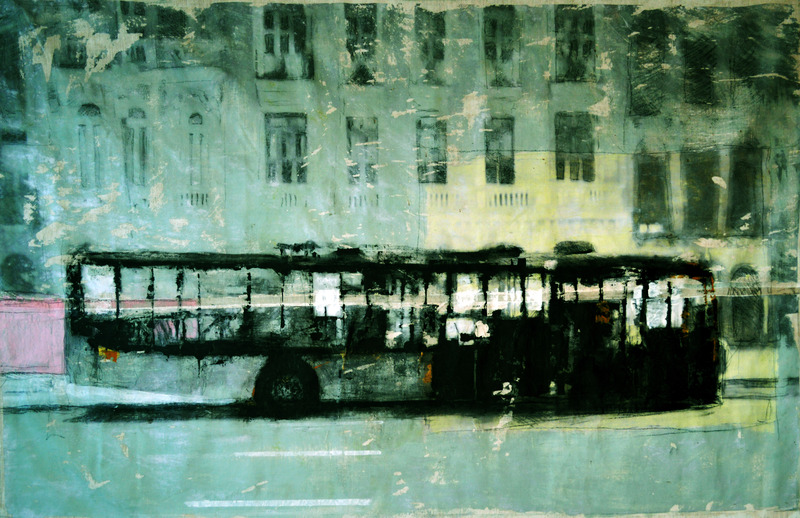 Now the central image in the exhibition is a burned-out bus. “At about this time last year, I saw that burned out buss and it was a picture that got stuck in my memory. It became a symbol of failure, both political and personal” Ulf Lindell April 2018. And even if this show contains several strong pictures that tell scary stories about circumstances in Rio de Janeiro and all Brazil, it is not these stories that occupy me the most when I stand in front of the canvas. It’s a completely different agenda that controls it. The metaphysical agenda. The magic that lifts an image into art. Centro de Arte Maria Teresa Vieira, Rio de janeiro, Brasil”Mesmo que esta exposição contenha várias imagens fortes que contam histórias assustadoras sobre circunstâncias no Rio de Janeiro e em todo o Brasil, não são as histórias que mais me ocupam quando eu estou diante da tela. É uma agenda completamente diferente. A agenda metafísica. A magia que levanta uma imagem na arte”, explica o artista. Segundo Ulf Lindell, as imagens tornaram seus trabalhos mais abstratos. Ele cita um comentário do renomado artista alemão Gerard Ritcher, quando foi criticado por saltar entre estilos: “O estilo é violência, e não sou uma pessoa violenta”. ”Burned-out bus”. 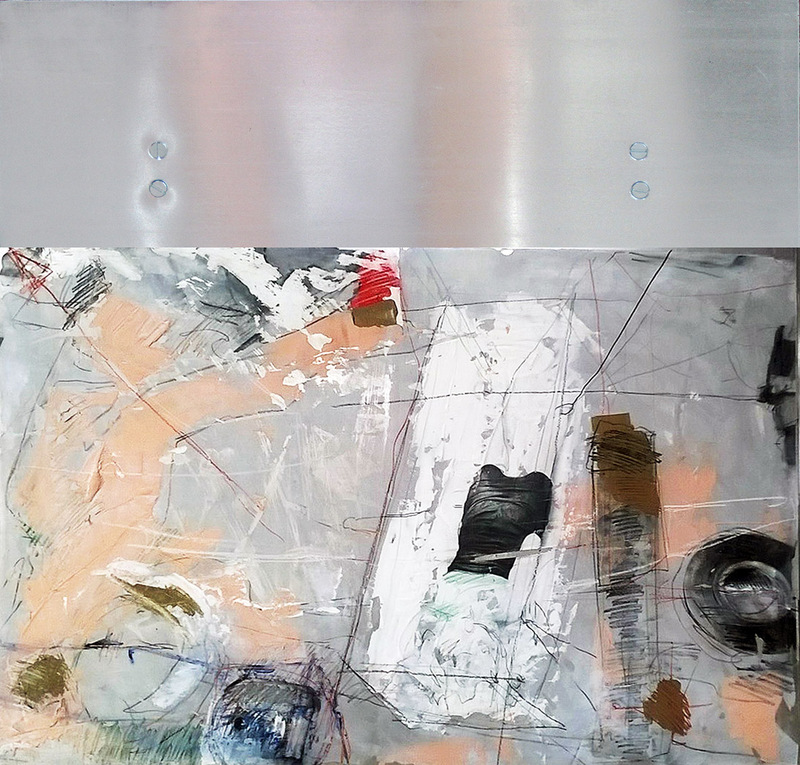 2017, mixed media on canvas, 150×250 cm. ”The owner”. 2018, 220 cm x 160 cm, mixed media on canvas. ”Monochrome”. 2018, mixed media on canvas 150 x 110 cm. Todos juntos na abertura do show,”Símbolos” no centro de Arte , Maria Teresa Vieira. 12/4 2018. 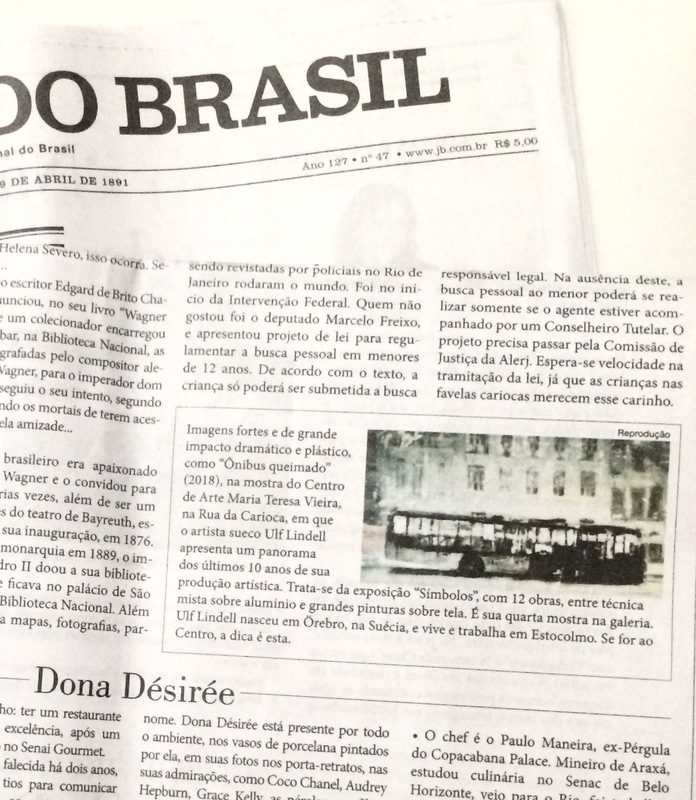 Artigo sobre o show ”Símbolos” no Jornal do Brasil. 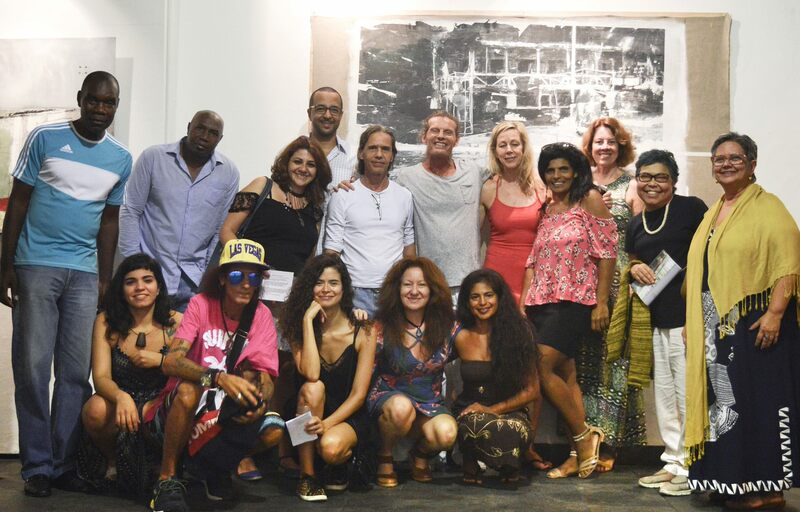 ”The House of paradise” was shown on April 30, 2016, in La Garage in Grajau, Rio de Janeiro, Brazil and later it was moved to the Art Center Maria Teresa Vieira, also in Rio de Janeiro, Brazil, where it was exposed 4-25 of May. It all started with a dream about a bright white house. There were people in the house and they seemed to be as enlightened and happy. I started to work with images of a broken marriage. The house was like a dream that could not be maintained. As walls, we built to protect the things we want to keep desperately. A metaphor for safety, more than for happiness. The house becomes then an illusion of happiness. The history of the House of Paradise, along with the untouchable bride, treat the unattainable. The desperate search for an illusion created by each one of us. The subconscious does not distinguish imagination from reality. This house of paradise is in the concreteness of our imagination, where dreams are a complex pictorial work. Integrated hallucinations make a dreamlike scene. 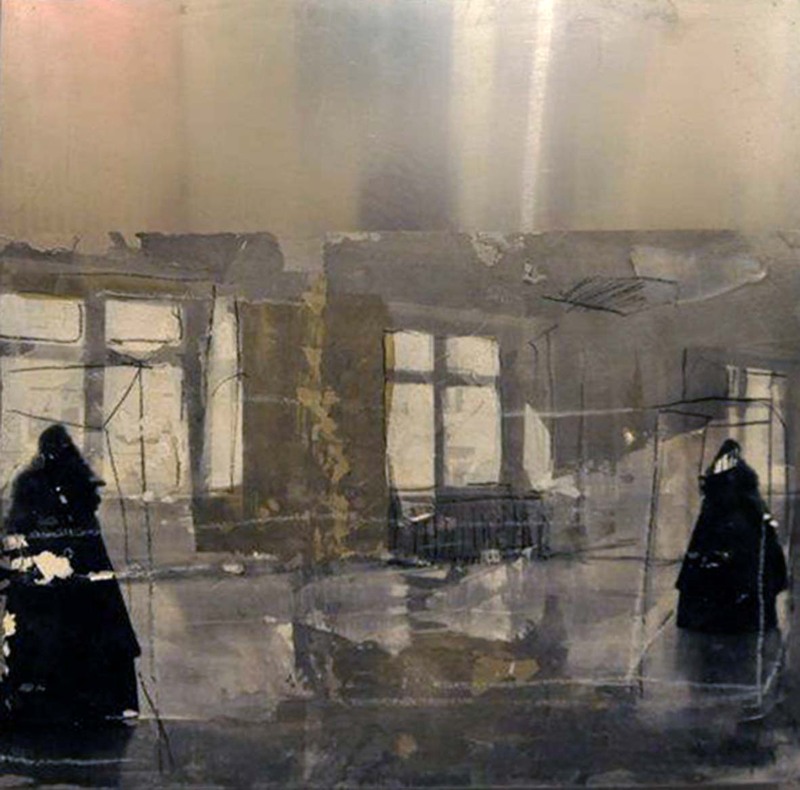 The images are made in a technique that is a kind of monotype. Over time, they became more abstract. Still, they have a lot of figurative approaches. This search for a balance between the figurative and the abstract during the working process is a target, which becomes a slit, which reveals this search as a continuum. ”Broken doll/Fallen angel”. 2016, mixed media on aluminum 100 cm x 100 cm. ”The untouchable bride with her untouchable friends”. 2016, mixed media, 50 cm x 50 cm. ”The soundless elevator”. 2016, mixed media on aluminum 70 cm x 100 cm. Opening night of ”THE HOUSE OF PARADISE AND THE UNTOUCHABLE BRIDE” Centro de Arte Maria Teresa Vieira, Rio de Janeiro, Brazil. 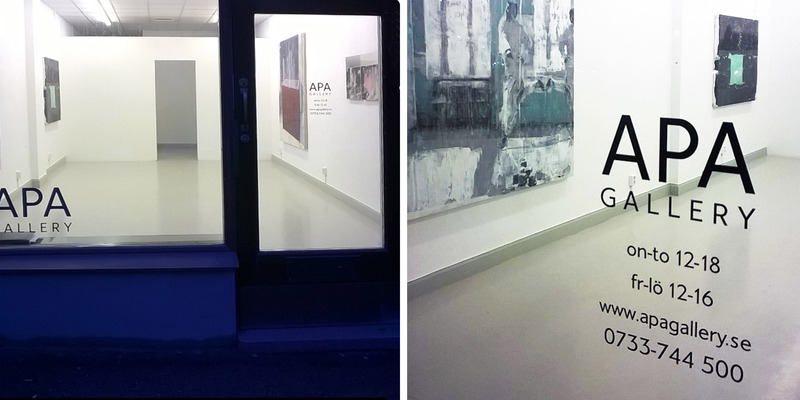 APA GALLERY Gävlegatan 1. Stockholm. My exhibition “Sloth” was shown in January 2015. When I’m done with my pictures I am always looking for entrances where I can crawl into. The more openings, I find, the more convinced I become that the painting will work. I climb into the hole and remains there. The tranquillity of a sloth occupies me. The technique I use, I have stuck to, precisely because it is so unreliable. I never know how the result will look like. In the final phase, During this process occurs often surprises. Cracks are opening up, and tear whole landscapes apart, like an earthquake, Not until I’m completely done with all the work I can get a true description of the situation. How much of what I previously knew existed, and what is new, behind the rifts and collapsed buildings? When I re-use the materials I have previously occupied me with, I notice that some works have exactly the same effect on me as when I did them the first time. For example. ”Dancer still in Fallujah” where I just added that little word ”still” in the title, then the apparently eternal conflict between Shia and Sunni Muslims; and now also Daesh; still poisons the region. 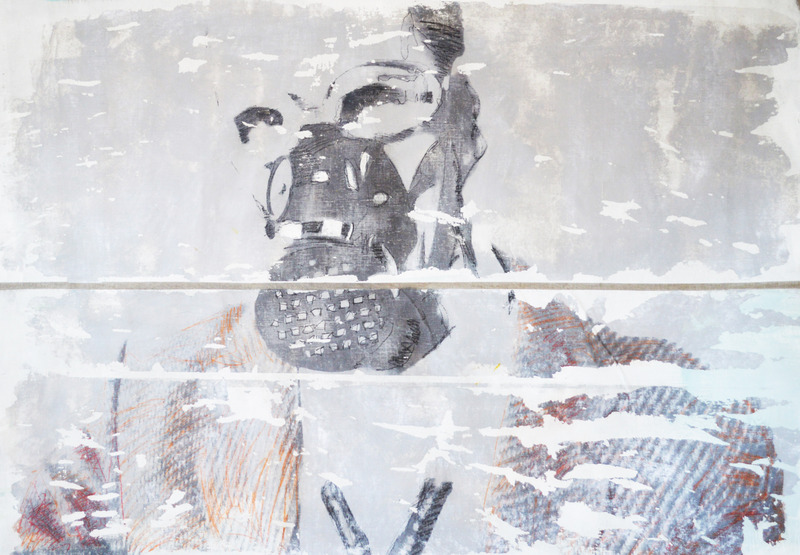 Ulf Lindell’s exhibition ”SLOTH” consists of a number of variations on the earlier work. Most of these works were made on aluminum sheet. Here they occur in large format on canvas. They are like fragments from the various exhibitions that took place in Moscow and St. Petersburg in Russia to Rio de Janeiro and São Paulo, Brazil, with the hub here in Stockholm. ”Dancer, still in Fallujah”. 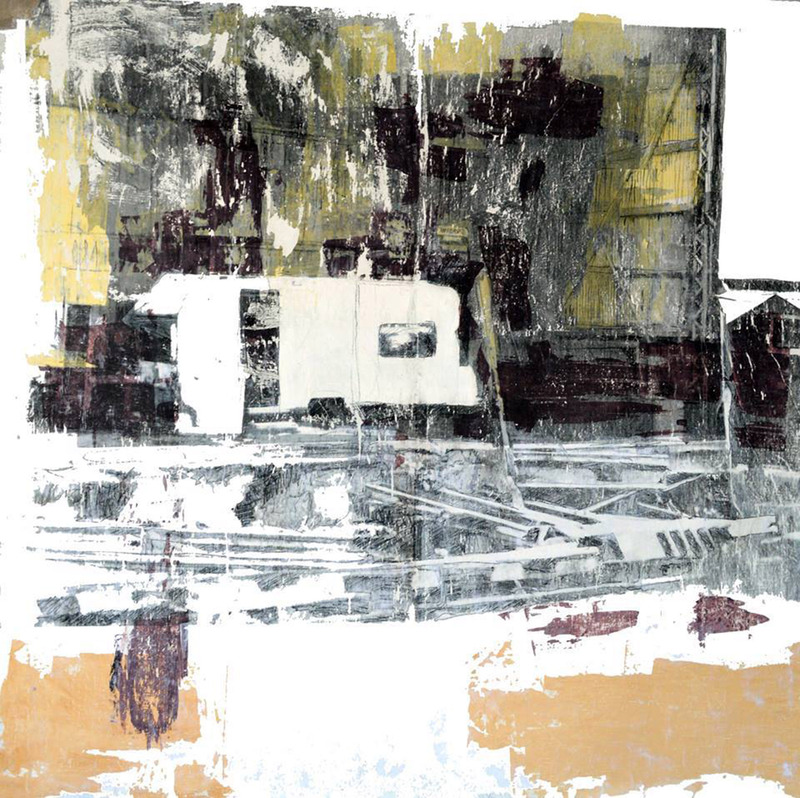 2014, mixed media on canvas 190 cm x 190 cm. 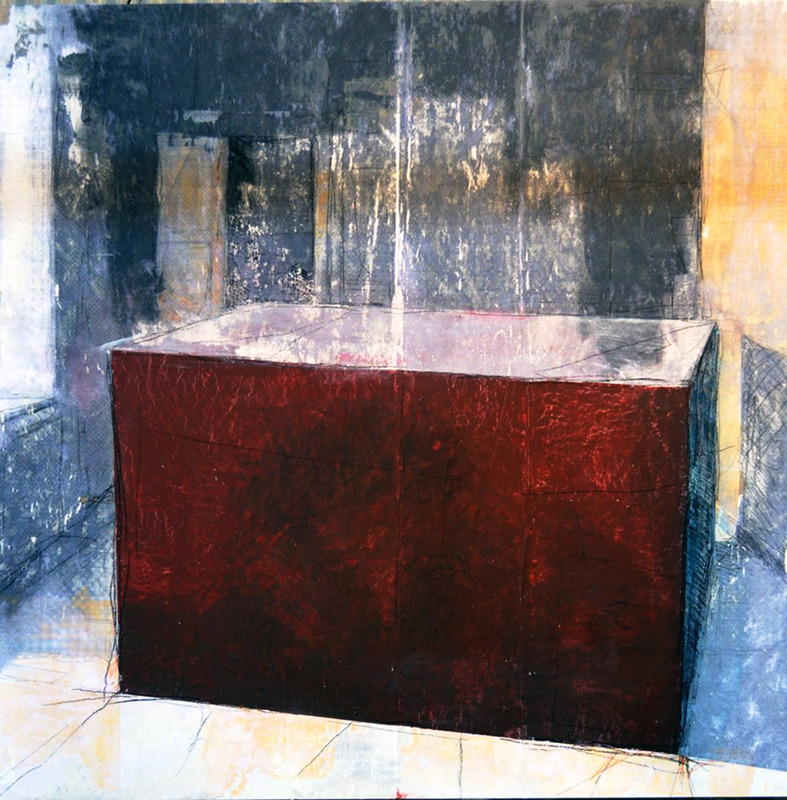 ”Red cube in a white room, with an escape route”. 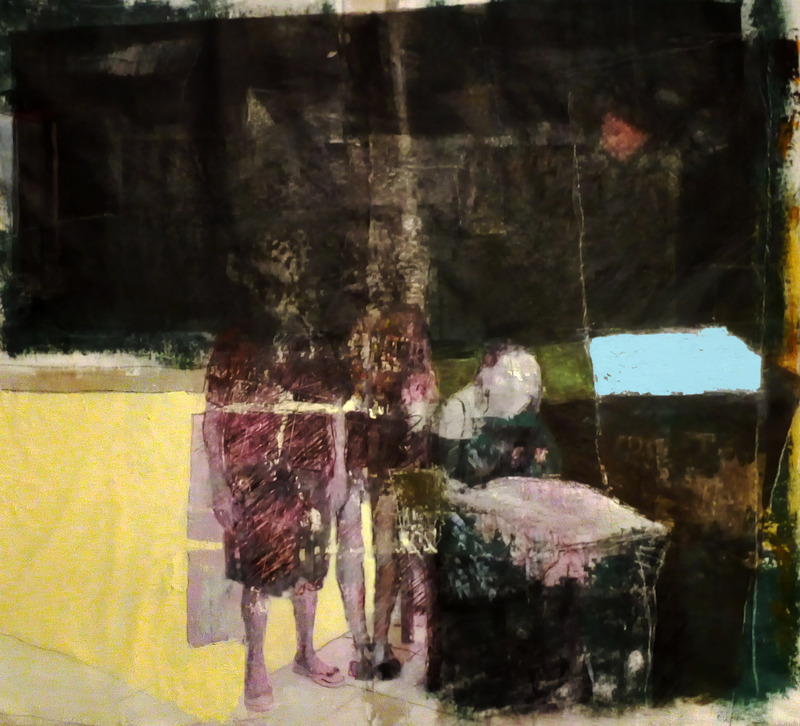 2014, mixed media on canvas 190 cm x 190 cm. ”Hidden landscape”. 2014, mixed media on canvas, 150 cm x 130 cm. ”The caravan of Carl”. 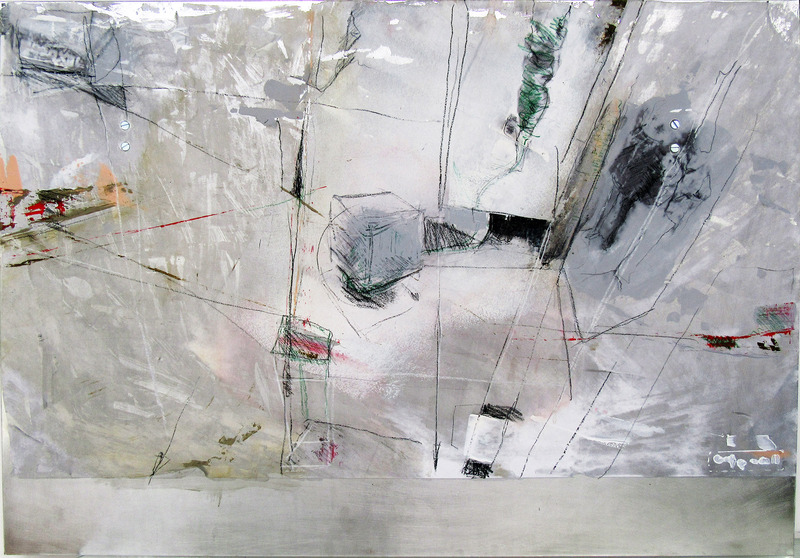 2014, mixed media on canvas 190 cm x 190cm. 2012 ”MISDIRECTED ATTENTION REQUIRED” Part of the Baltic Biennial, All Gallery, St Petersburg, Russia. 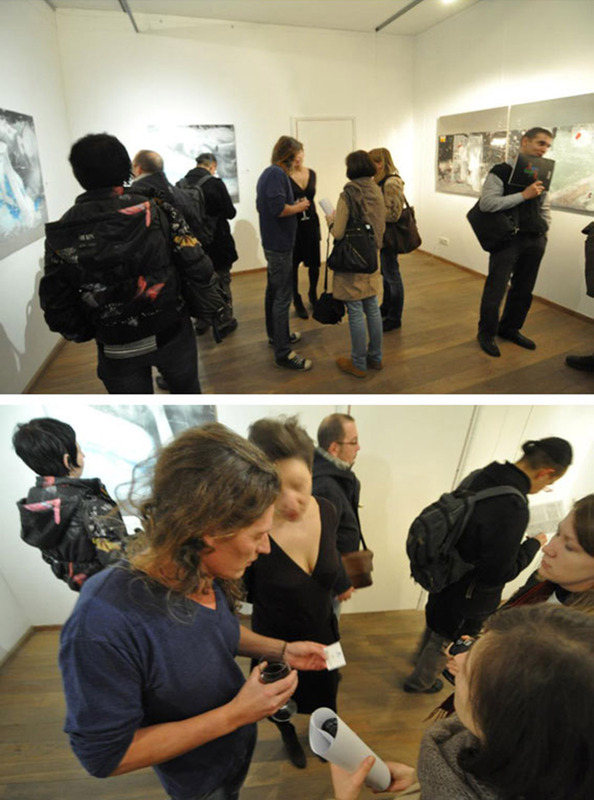 Opening night of ”Misdirected attention required” at All gallery in St Petersburg, Russia. 25 October. All gallery, St Petersburg” Misdirected attention required” is a show about love-thirst that is turned on and off at a high speed. The name alludes to a kind of game, where indifference embodies the dilemma of keeping multiple views or choices while seeking decisive balance. Perhaps we can elevate indifference to a utopian state of active impartiality, endless options and the opportunity to develop in more than one direction rather than a pejorative description of a selfish game. My shows are usually produced during periods of six months – one year. Furthermore, I link them to each other by a few works recur in different variations. I take photos or collect materials of various kinds in the first six months. 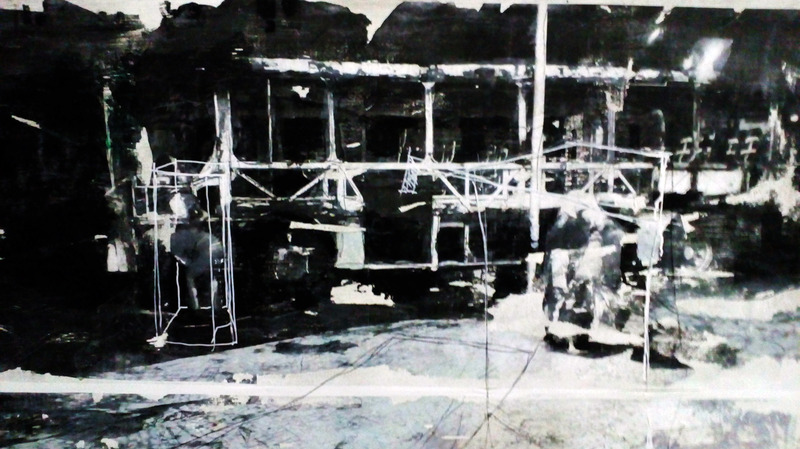 Then I select a few of these that I feel strongest for and begins to work with my monotypes. I returned to Rio de Janeiro in early 2012. I would stay for six months with Rossana, a friend for many years. It had started with a brief fling but soon it was changed to a deep friendship. A friendship that ran alongside my slightly chaotic relationships with two women who both knew Rossana well. Thus, she was always around during the time when I slowly approached an emotional collapse and a subsequent self-imposed break from all types of sexual relationships. I had a plan already when I came to Rossana`s apartment. She would be my female alter ego in my next show. ”Rossana begging”. 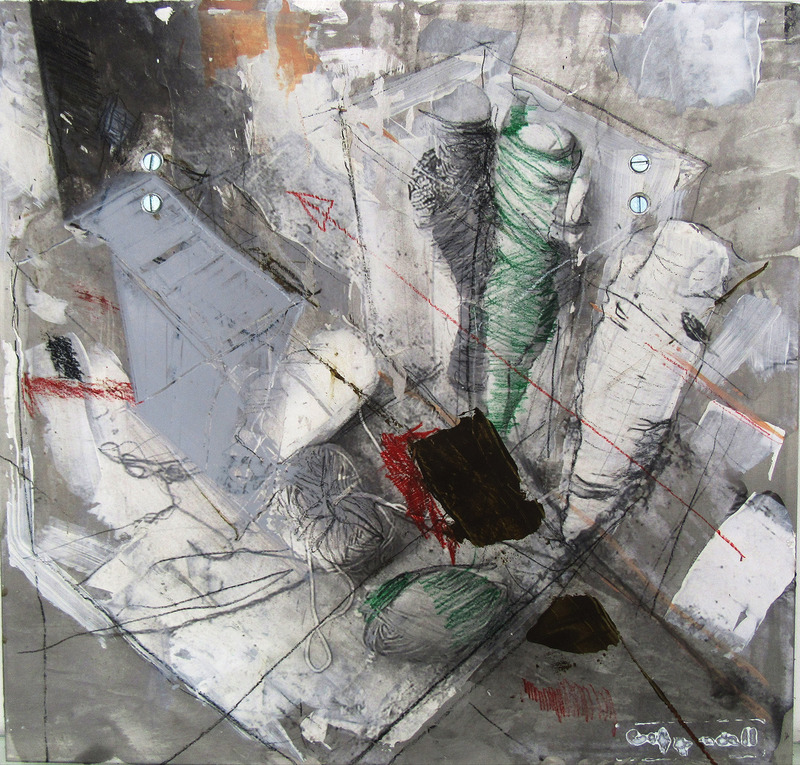 2012, mixed media on aluminum 100 cm x 100 cm. ”Rossana gives you her finger”. 2012, mixed media on aluminum 100 cm x 100 cm. 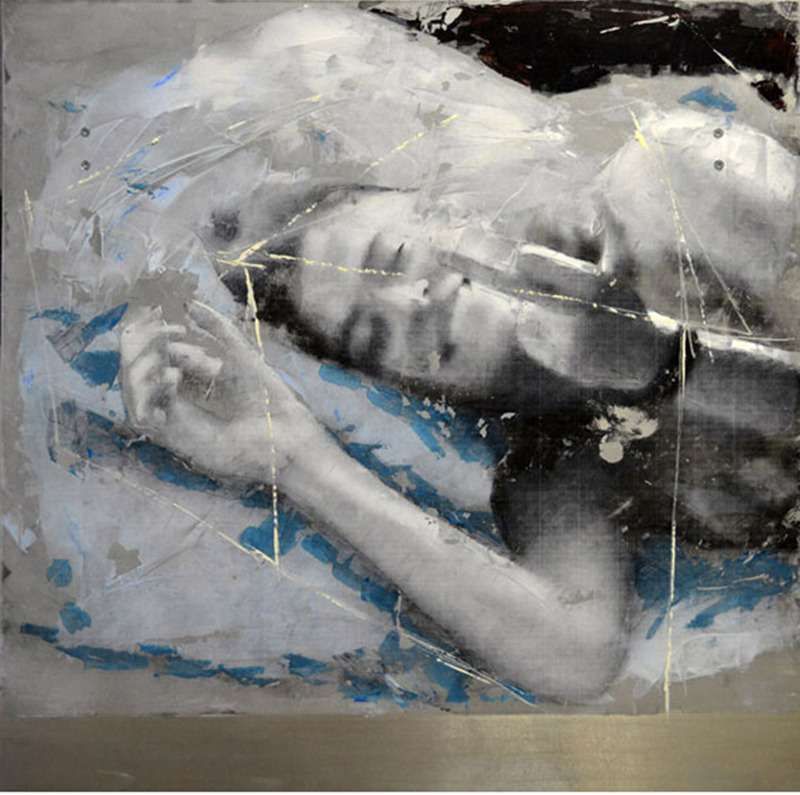 ”Rossana laughing” 2012, mixed media on aluminum 100 cm x 100 cm. ”Face Rossana with chairs. 2012, mixed media on aluminum 100 cm x 100 cm. I usually paint cages around my characters. I like to call the cages ”deterministic rooms”. I do not mean to say that people are predestined but I assume the soft determinism that one finds in the world of philosophy. Can we perhaps see the soft determinism as an existing balance between those who are treated well and the mistreated? For this exhibition, I have used the work of two previous shows of mine. 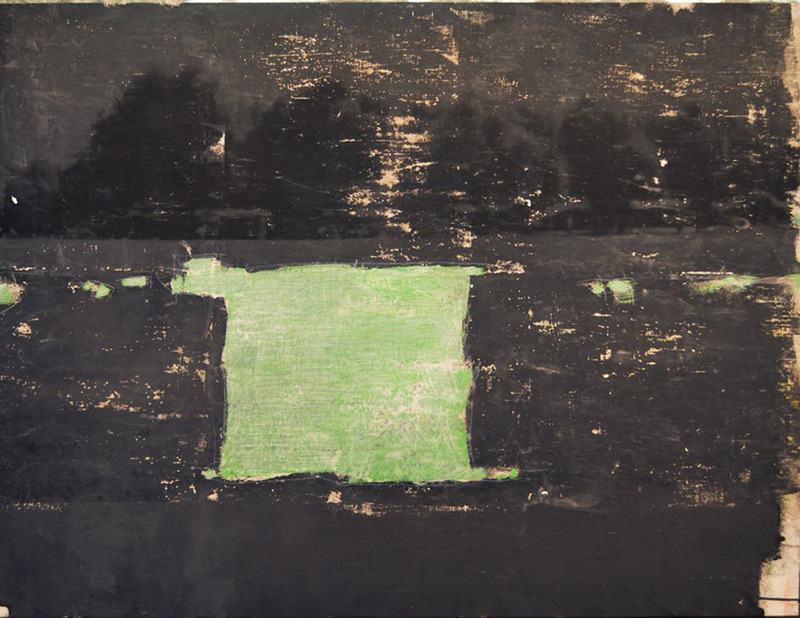 The first one, named ”Inutil” was shown partly in 2008 in the Gallery Operating place in Stockholm, and the following year it was shown in its entirety at Centro de Arte, Maria Teresa Vieira in Rio de Janeiro, Brazil. It took up the themes of civil resistance; stone throwers were depicted as freedom fighters or terrorists. The second exhibition, ”Under her yellow sneakers” was shown in 2010 at AD HOC Gallery/ SMAK, Stockholm, Sweden. In the artworks were people, trapped in their cages, , in the subway or in the streets of Rio de Janeiro, during the carnival earlier that year. When I do try to bring together these two very different exhibitions, the identities are erased and the images become more similar. The stone-throwing person in Fallujah might as well dance on Rio de Janeiro´s streets. The vague, the poetic, seems to have a prominent place. ”Girl looking”. 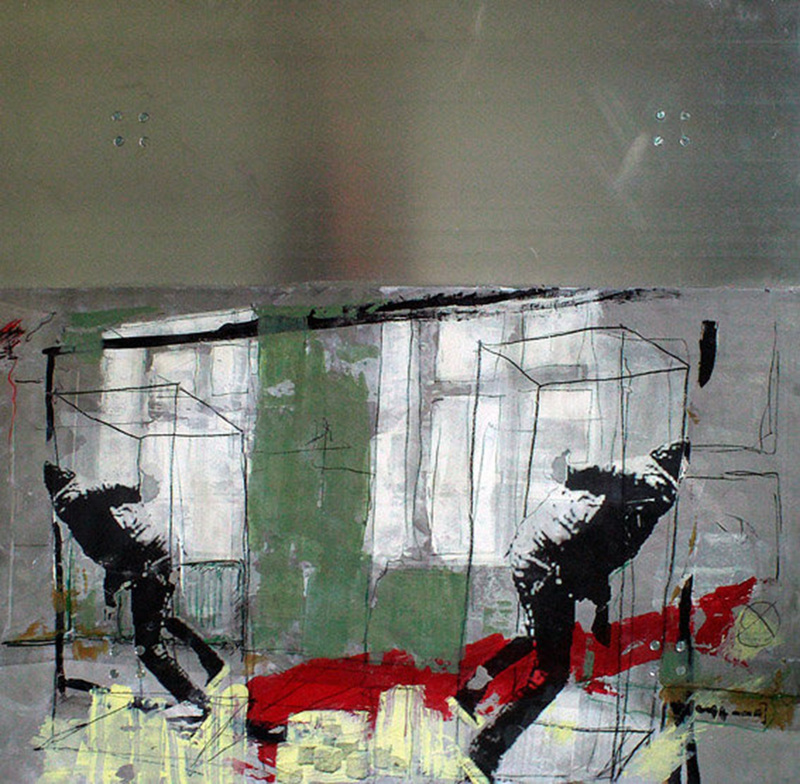 2010 mixed media on aluminum 2 x 100 cm x 100 cm. Detail from ”The moth ended up on her breast and stayed there before flying off again. Once the moth had flown off, she looked the slightest bit older”. 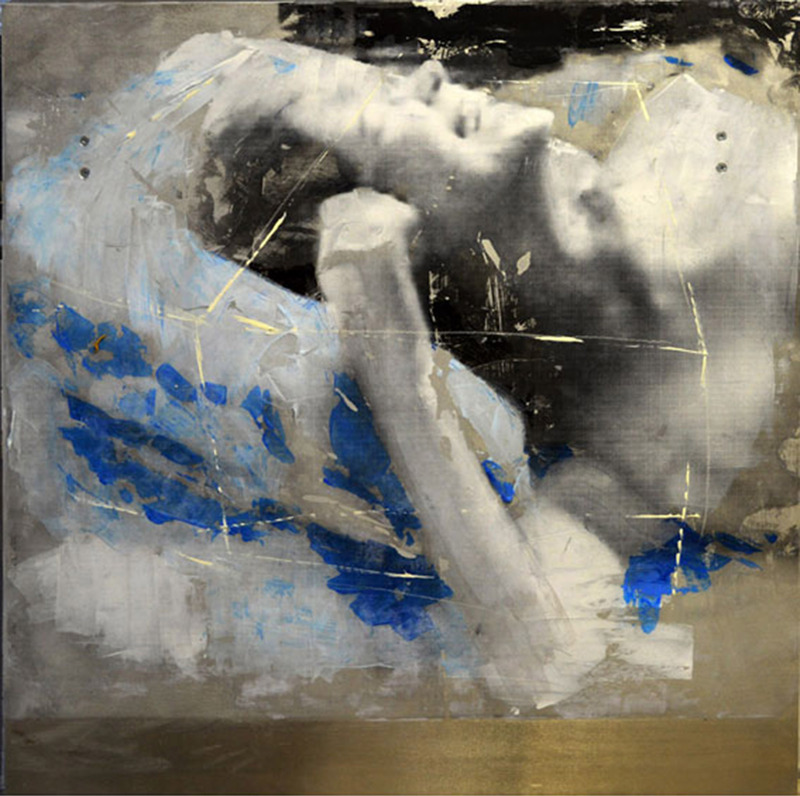 2011, mixed media on aluminum, 100 cm x 100 cm. 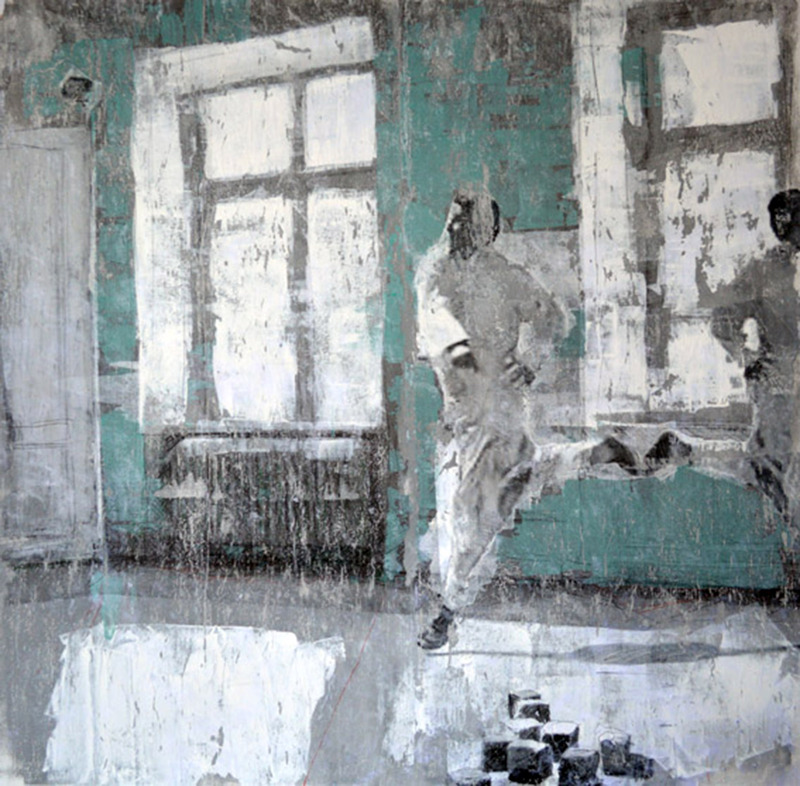 ”Dancers in Gothenburg”. 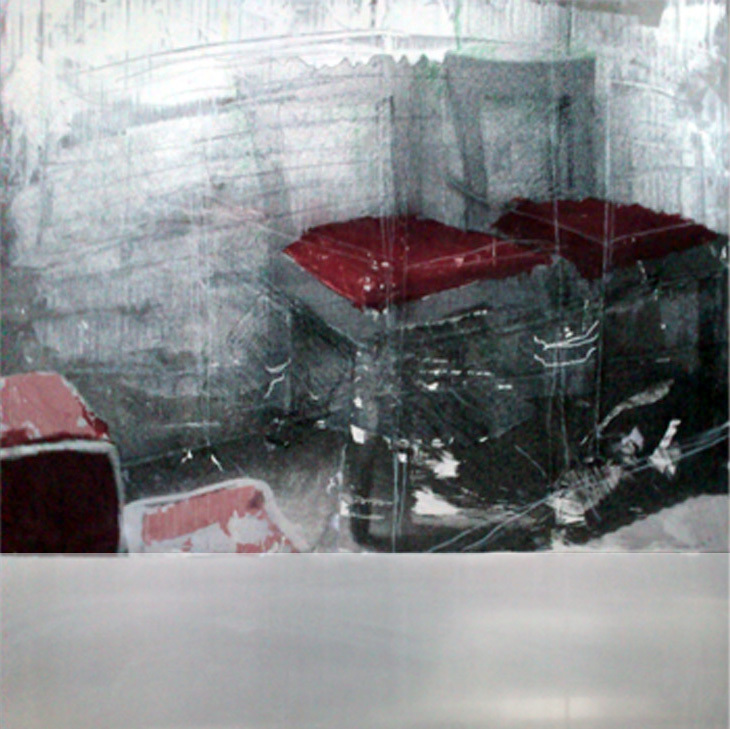 2008, mixed media on aluminum, 100 cm x 100 cm. ”In the other end in the room, there is a silence going on”. 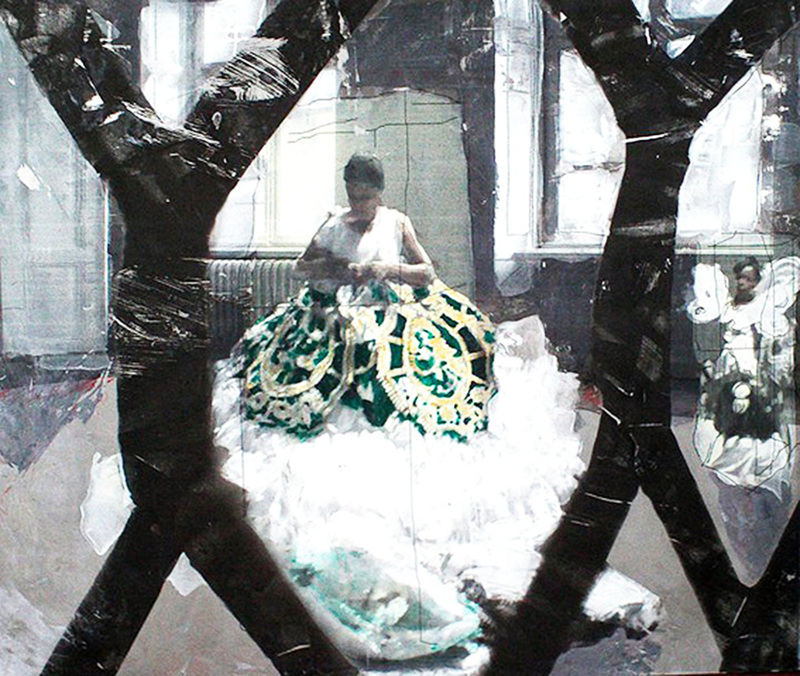 2011, mixed media on aluminum, 100 cm x 100 cm. ”Loneliness wasn`t such a bad feeling. It was like the stillness of the pin oak when the little birds have flown off”. 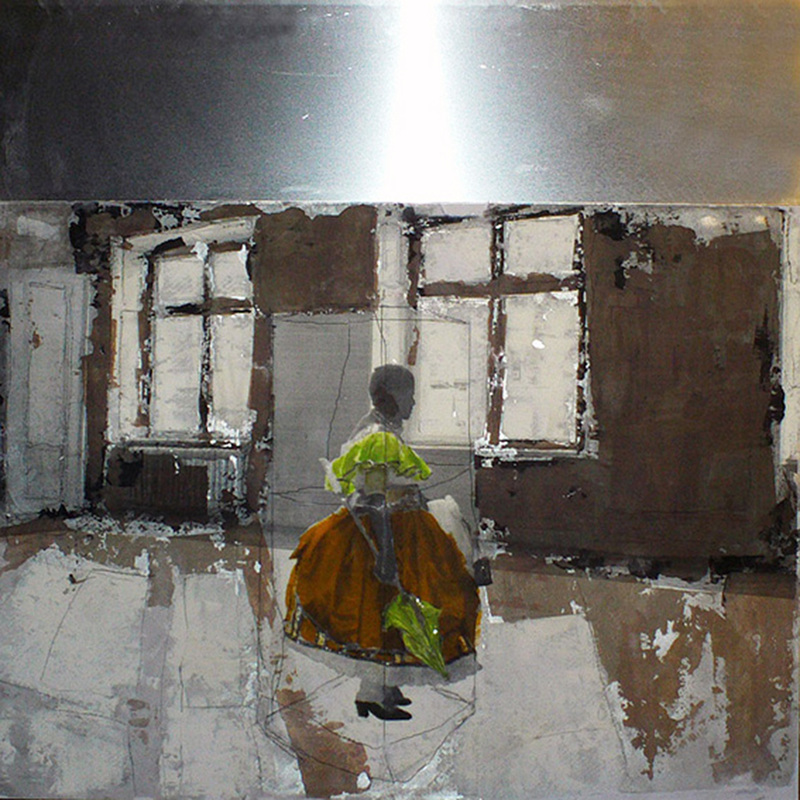 2008, mixed media on aluminum 50 cm x 50 cm.